The Dinner of Muses is a unique opportunity to have a dinner in the beautiful place. Tables and chairs will be settled around the large pond Miroir d’Eau. The castle and its gardens will be illuminated by 2,000 candles. Such enchanting atmosphere will fascinate you! Since its founding in 1983, the Association has organised various events. Collected funds allow financing the restoration and beautification of the castle and its surroundings. That is one of reasons the Dinner is arranged – to save the rich heritage. This year, it will be held on Saturday, June 21. Come to the castle at 7pm with your dinner and table decorations. The event will be held under the theme “green and white”. The most creatively and interesting decorated tables will be rewarded with prizes. Entrance fee is €35. In this evening, you’ll enjoy classical music, fireworks, water show, and of course the majestic place! You are advised to book places in advance as they are limited. 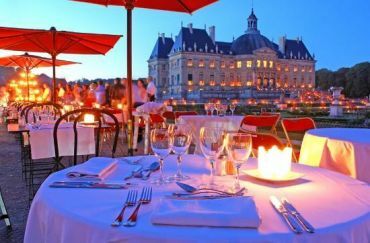 Booking is available at the official website of Château de Vaux le Vicomte. Albi Carnival is the oldest in France. And he will be held from 8 to 16 March 2014 during Lent. Another European country, which is replete with carnivals and fun holiday is France and the city of love and romance - Paris, famous for its traditional and one of the oldest events of "Paris carnival." Between February 14 and March 4, Nice is hosting its traditional carnival, one of the largest and oldest in the world. Every year, the Cote d'Azur attracts more than a million people.